Blue Ivy is reportedly set to play a very important role in the arrival of her twin siblings. The five-year-old, who is the daughter of superstars Beyonce and Jay Z, will allegedly be present for the birth of her siblings. Beyonce is said to want Blue to be in the birthing suite throughout the delivery, as part of her plan to help her bond with the babies and avoid any jealous feelings. "Beyonce has decided Blue will be part of the delivery process to make sure that she's not jealous of her new siblings," a source told Heat magazine. 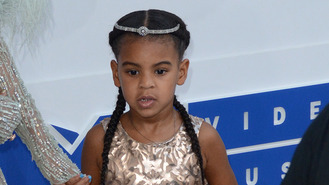 "Blue has her own birth plan written up and will be staying in the room throughout. She's set to be the first person to hold the babies after the doctor handing them to Jay Z." According to editors at Heat, the unusual step is just one factor in the superstar's elaborate, "no-expense spared" birthing plan which includes commandeering three suites at Los Angeles’ Cedars-Sinai hospital and a move to a rental property nearby. "Bey and Jay want three suites in the hospital - they only had one for Blue," added the source. "This will give their people space and allow for security, who are needed because people will inevitably try to sneak in and take pictures of the twins. They're not taking any chances." Despite her relative youth, remarkably an excited Blue isn’t reportedly nervous about seeing her mother give birth. And fashionista Beyonce has made sure she is properly kitted out for the event, picking a designer outfit especially for Blue who has some big responsibilities on the day. "Blue's got a $1,200 (£925) Givenchy nurse's outfit, and a notepad to write down the twins' weights," smiled the insider. "She will also help to tie the identification bracelets on their wrists." Last weekend (20-21May17) the family celebrated the twins' imminent arrival with a lavish African themed "Carter push party" at a private Los Angeles home which was attended by family and friends including Jay, Beyonce’s sister Solange, Serena Williams, and Destiny’s Child bandmate Kelly Rowland. Cheryl is reportedly set on marrying boyfriend Liam Payne following the birth of their child. Legendary rock star Gregg Allman has passed away at the age of 69. Mel B's estranged husband Stephen Belafonte has filed court documents in an effort to secure a big payday from his ex. Noah Cyrus is determined to step out of her sister Miley Cyrus' shadow. Taylor Swift is reportedly being more guarded with her rumoured new romance than she has previously been with love. The X Factor boss Simon Cowell was instrumental in helping Liam Payne date Cheryl. Liam Payne recalled the embarrassing moment hip hop mogul Diddy laughed in his face when they met for the first time. Liam Gallagher will donate the proceeds from his first solo show in Manchester, England to the victims of the city's bomb attack. Mel B leaned on the spirit of her late grandfather for support ahead of her nasty divorce from Stephen Belafonte.